Stakeholder involvement in the Rural Development policy context means engaging individuals ranging from policy designers to project beneficiaries in all stages of the policy cycle: from policy-making to better implementation on the ground. Policy and programme designers and implementers: political decision-makers; public administrators in national, regional and local authorities and European institutions; and LEADER Local Action Groups. Interest group representative bodies: organisations representing farmers, landowners, forest managers, rural businesses, actors along the food chain, environmentalists, researchers, rural communities, and disadvantaged groups. Actors on the ground: potential and actual beneficiaries and participants in EAFRD projects, with farmers and land managers at the forefront. 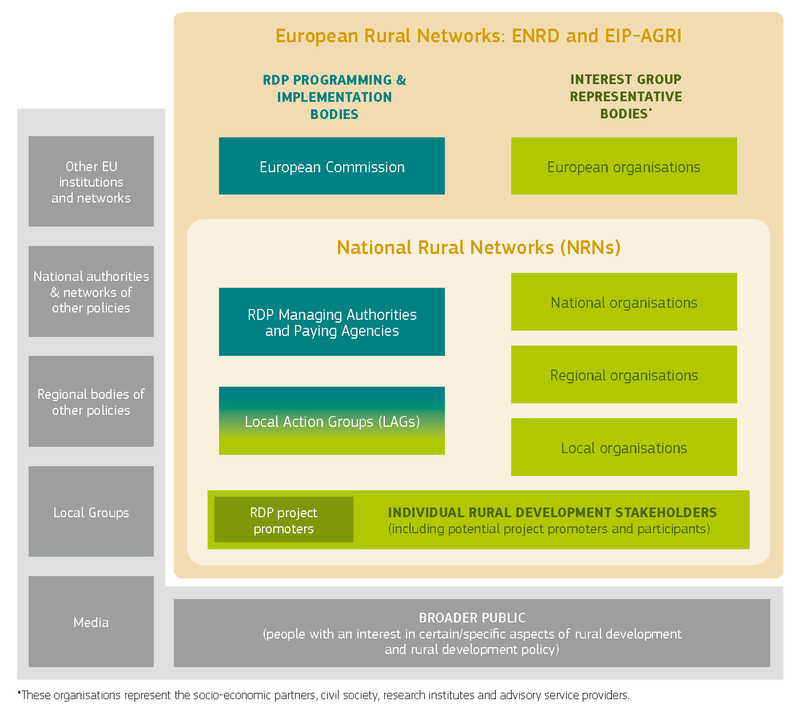 Rural networks, both at the national (NRNs) and European (ENRD) levels, can add the most value in bringing the wide range of stakeholder groups together in a common platform. In the 2014-2020 programming period, networks have both a stronger mandate and an obligation to increase stakeholder involvement as a means of improving the design and implementation of Rural Development policy. The chart below visualises how rural networks provide a framework bringing together the diverse groups of stakeholders. Help reach out to and inform a broader concerned audience of the benefits of the policy. The ENRD Contact Point is continuously working to improve stakeholder involvement through the wider ENRD network by building capacities and enabling exchange and information flows among the various stakeholder groups. European Seminar in March 2015.